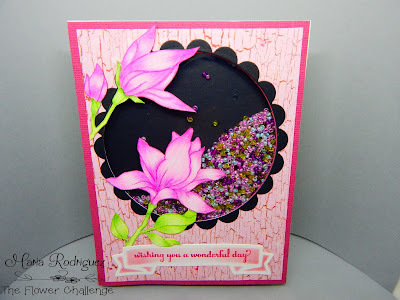 Hello Blogging friends: Today I have a fun shaker card I created for THE FLOWER CHALLENGE Anything Goes Challenge #18. 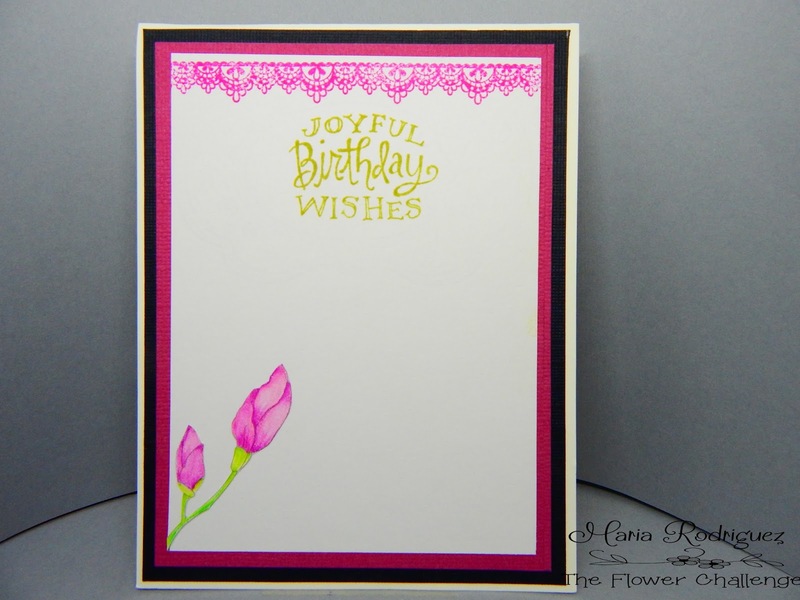 I love this types of cards and I should make them more often, they are really fun to create and receive. This card was made with one of the beautiful images donated by the very talented Eunji Jung, to my teammates and I to inspire you to come and play with us in the gallery. She also has generously offered these two images to one lucky winner so, we all hope you come and join us. I printed the flowers on a piece of Bristol paper and colored it with my Prismacolor Pencils, then I fussy cut them and glued them to my shaker window. I added some beads and a sentiment from the Power Poppy set called Dynamic Duos: Peonies and Tulips, the pattern paper is from a retired line from Lili of the Valley. 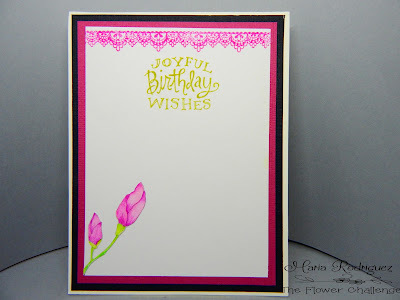 The decorative edge is from a retired SU set called "Delicate Details", the sentiment is from another Power Poppy set called Potted Primroses, I also printed the smallest flower on this trio, colored it and fussy cut too. 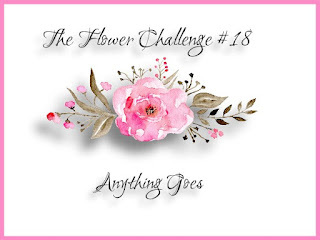 I hope you get inspired to come and play with us in THE FLOWER CHALLENGE gallery and, while you are there, check out my teammates amazing projects. Please read our rules carefully, you need to follow them to be eligible to win the prize and don't forget to add the challenge banner when you upload your card to the gallery. Love this beautiful shaker card, Maria. The flowers are so pretty with the black to back the shaker beads. You're right about shaker cards being fun to make and to receive. Enjoy your week! Love the snipped flowers and splash of the shaker beads! really cool looking card with the pink and black...great visual impact and that you made it a shaker too...well done. What a chic color combination, Maria! The shading on the flowers looks beautiful! And the black shaker part is so cool!